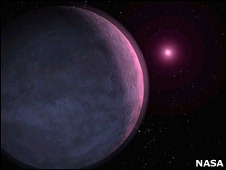 Astronomers have sighted the smallest extrasolar planet yet which orbits a "normal" star, or a brown dwarf. A smaller world has been found orbiting a spinning neutron star known as a pulsar, but these produce radiation that would be lethal to any life forms. The latest planetary discovery orbits an object which is itself of such low mass it may be either be a "failed star" known as a brown dwarf, or a very low-mass hydrogen burning star called a red dwarf.